He made the call during presentation of a donation of animal feed to farmers and cattle dealers which were held at the Abuko Abattoir recently. Mr. Jallow urged the youth to venture into the business which he said would enhance their skills development and change their lives. That way, he continues, cattle rearing can prevent the youth from embarking on the risky journey to Europe through the “back way” and its attendant waste of resources. According to him, cattle rearing can help the youth breed more animals at their backyard and expect more money during the festive period of Tobaski, where one can sell animals at the price of 6000 to 7000 dalasi for a ram, adding that not many civil savants can get that amount at the end of the month. Mr. Jallow further called on cattle dealers and youths of the Gambia to redouble their efforts in promoting livestock production to meet local demand and enable the country archive its goals in cattle rearing and serve as an alternative source of socio-economic development in the country. He emphasized that Gambians have been forcing themselves into crop production only and not knowing that livestock business can be as important as crops and make people rich just like those in other important income generating activities. He assured of his association’s support towards improving livestock production in the country. This, he added, would also help in addressing the morbidity challenges confronting animal rearing with a view to enabling them to become more effective in further promoting animal rearing activities. While advising dealers to be united and work towards achieving common objectives, Mr. Jallow called on GLMA to strengthen partnership with the livestock dealers association, towards enhancing growth. 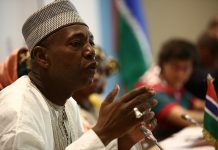 He also urged GMC, the donor and company dealing in animal feed, to produce more than enough for animals so as to avoid many Gambians traveling to other countries to buy feed for their animals which he says makes the sale of animals at higher price in the local market. Jallow also thanked the GMC for their support and assured the company that the animal feed donated would be used as expected. He also said that with the intervention of GMC all Gambians can now rear animals across the country as far as animal feed is available.